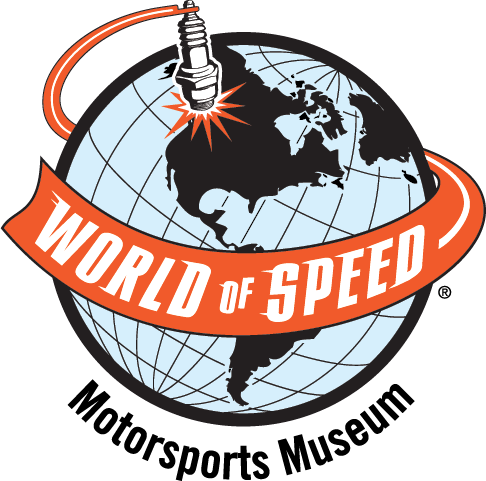 World of Speed Motorsports Museum features the historic race cars, boats and motorcycles that tell the story of motorsports. 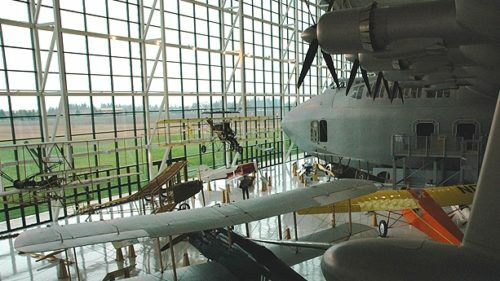 Through interactive exhibits and hands-on activities, the museum offers visitors a behind-the-scenes view of the racing world. From the Hot Wheels they wooshed around the floor when they were small to the Pinewood Derby cars they designed as Scouts, my boys have always had a need for speed. Engineers at heart, they are fascinated with how things work — how to make things faster, stronger, more efficient. So a trip to the World of Speed Motorsports Museum in Wilsonville, 20 miles south of Portland, proved to be a worthy family excursion. Kids of all ages can test their start-line reflexes at one of the interactive stations. Photo by Jen Anderson. 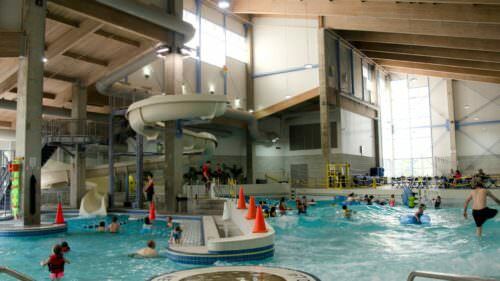 Conveniently located just off Interstate-5, this bright and airy space is a hot destination for school groups, Scout groups and summer camps for good reason: There’s so much knowledge inside. Sure, the fancy cars will make auto buffs swoon, but inside every engine is an intricate web of electronics — a perfect vehicle (pun intended) for young and old visitors to soak up STEM (science, technology, engineering and math) concepts. Kids may not be able to explain the physics behind a nitro fuel pump, but will likely relish pressing the buttons that demonstrate the theories. A button and pedal on the demonstration “supercharger” machine triggers a “roots blower,” which blasts air through a tube that carries a toy race car to the top. “Up you go, little race car,” my 10-year-old cheered. The Start Line Club is an auto-focused playground for young children looking to get their hands on everything. For the younger grade school set, the Start Line Club nearby the entrance is a haven for hands-on learners. Tinkerers like my own could spend days at the magnet wall, piecing together pipes, tubes, connectors and ramps in ideal formation to send a ball down quickly or slowly. 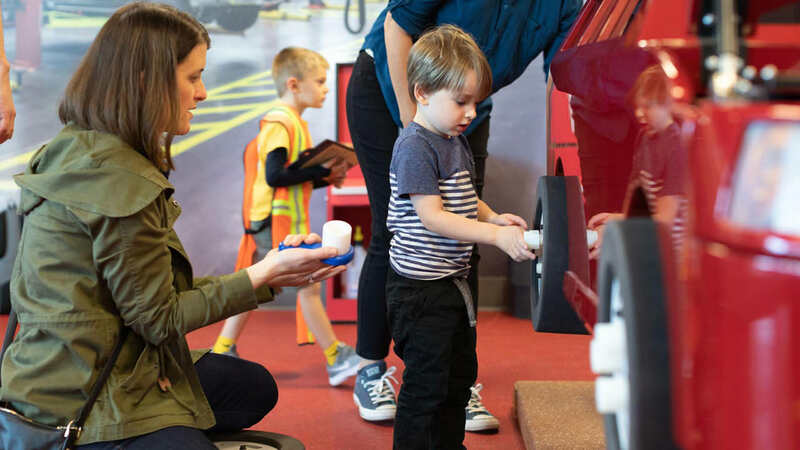 A cherry red car, child sized, is poised in pit crew position, ready for little mechanics to diagnose and fix any problem they find by checking the oil, changing the tires, even sliding underneath to replace the muffler using play tools. Kids eager for some seat time can hop into a shiny blue Mustang and put the pedal to the metal. There’s also a giant slot-car track, built by volunteers, which will make its debut at the museum’s family-friendly Art Pollard Day (May 4, 2019), celebrating the life of the legendary Indy racer. On Saturdays, whiz kids can get a close-up look of 3D printing demonstrations and immerse themselves in a Lego lab, a chance for families to get creative together. Within the year, the museum aims to create a large makerspace, included with admission, where kids will have the opportunity to do simple robotics and stop-motion animation with iPads, along with other kid-tested technology. The museum often hosts priceless race cars on loan from local collectors. Back on the museum floor, museum volunteers are ready to help with simulation driving at three real-life race cars (at a charge of $10 for 12 minutes). Drivers must be tall enough to reach the pedals and be able to shift gears, which makes it suitable for teens and up. 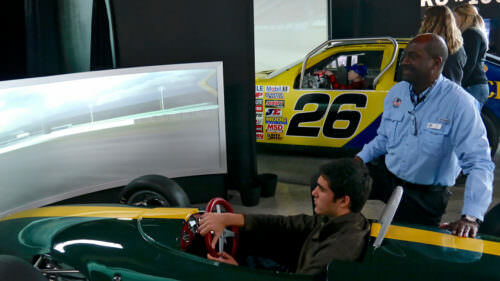 It’s a far cry from video game racing — much harder, my husband discovered — which makes the achievements of the racers celebrated throughout the museum all the more impressive. 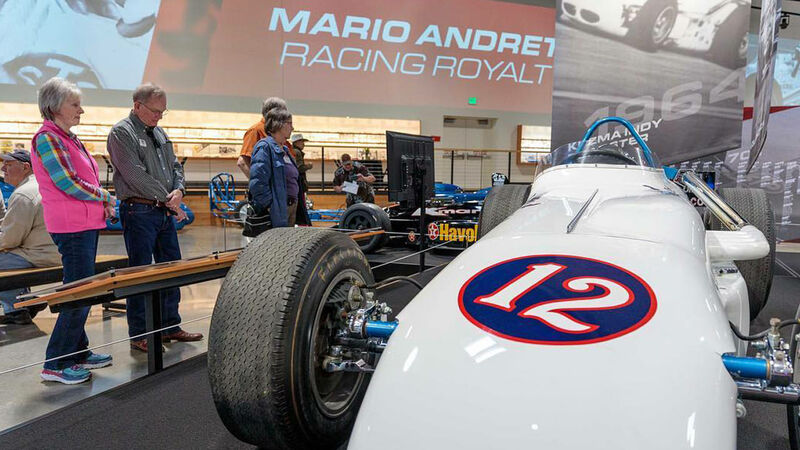 (Celebrate the most successful American race car driver of all time at the exhibit, Mario Andretti, Racing Royalty, honoring the 50th anniversary of his wins at Pike’s Peak and Indianapolis 500 and his success in 11 styles of racing.) An inspiring Women in Racing exhibit celebrates the accomplishments of of racing superheroes in a male-dominated field with photos, awards and artifacts — a breath of fresh air amidst so much testosterone. The Zero to 1,000 exhibit — or Wall of Speed — shows just how far human ingenuity has transformed our lives. Photo by Jen Anderson. 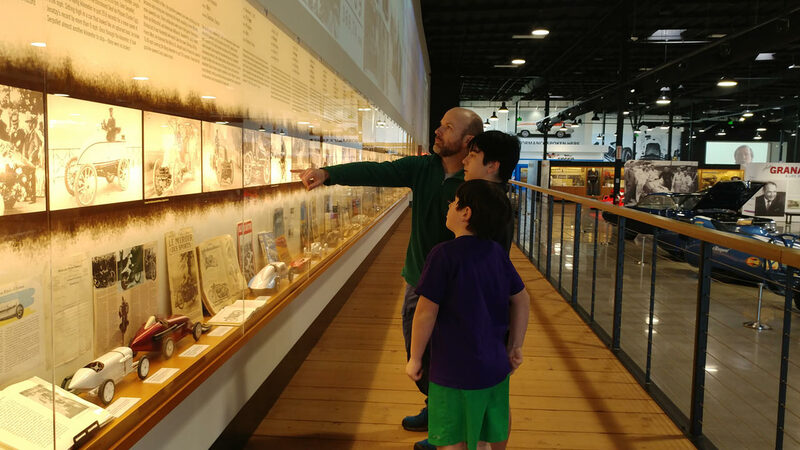 The open layout of the museum makes it easy for kids to choose their own path, including taking their time to soak in the Zero to 1,000 exhibit along the boardwalk. Here, kids can read about the real-life heroes who put everything on the line to beat the land speed record. “Whoa,” said my hard-to-impress teen, upon seeing that the record jumped from 200 to 400 miles per hour in the span of one year, in 1963. Along the opposite wall, the Wall of Sound celebrates the rockin’ music of auto culture — everything from Elvis and the Beach Boys to Cars and the Boss. Kids may not know the music, but their interaction with the artifacts is priceless. “What’s this?” my 10-year-old asked as he saw the jukebox. “What do you think it is?” I asked. “A multi-channel stereo,” he says, reading the sign on the display. I explained the concept of a jukebox — back when music didn’t come from earbuds — and he smiled as he understood: “Oh, I get it. I thought it was a weird type of keyboard.” Sometimes even the simplest discoveries are golden. Art Pollard Day (May 4, 2019), celebrating the Indy racer’s legacy and work with children with special needs. Music, crafts, racing activities and ice cream are planned. Winter holiday events, throughout the season, with ornament decorating, live seasonal music, reindeer racing and more. 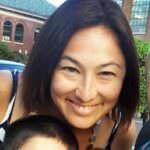 Otto’s Storytime Garage, Fridays year-round at 10:30 a.m., geared for 2- to 5-year-olds, free to low-income families.